Maximum length: 0,8 cm. Compare with the size of a hair. Appearance: Colour? The nauplius larvae swims with the aid of three pairs of extremities. The foremost two later develope into two pairs of antennae. The third pair became parts of the upper jaw (mandibles). The eye is situated in the middle of the foremost part of the carapace. 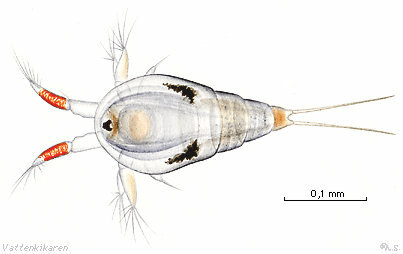 Nauplius larvae from different specie of crustacaens are quite similar, but nauplius larvae of the rankfotingarna are distinct. Depth: From sea-level to unknown depth. Misc: Most types of crustaceans hatch as nauplius larvae, but almost all tiofotade crustaceans hatch into a special type of crab larva known as zoea. There are also crustaceans that resemble their adult form when they hatch, for example, the opossum shrimp and märlkräftor. Nauplius larvae are most common during the summer and autumn and mainly live on the nutrition provided by the egg. Nauplius larvae grow and slough their shell several times before they became another type of larva or get their adult appearance. Many larvae are eaten by suspension feeders. Classification: Nauplius larvae are crustaceans that belong to the arthropods.